DUH! Dulci-More Ukulele Hangout, is a group that shares the enjoyment of playing ukuleles and singing along with a wide variety of songs. Players and singers of all levels are welcome. There are usually some loaner ukes available so that almost anyone can try joining in and playing along on some of the songs during the evening. More accomplished players are encouraged to lead or showcase songs for the rest of the group. Lyrics, chords, and ukulele chord diagrams are shown on a monitor for many of the songs so that everyone can join in easily. Chord help is given in various ways for other songs. A song circle approach is used so that each person attending has a chance to lead or choose a song for the group to play. DUH! meets at 7:00 PM on the second Tuesday of each month just off the sanctuary in the First United Methodist Church of Salem, 244 South Broadway, Salem, Ohio 44460. The first meeting of DUH! is on Tuesday, October 13, 2015. As an auxiliary of Dulci-More Folk and Traditional Musicians, other instruments are welcome in the song circle as long as the emphasis is kept on the ukuleles. In the beginning, most songs will be played in the key of C, but the group will probably quickly add repertoire in the keys of F, G, D, and other keys as well. If those attending know of an internet link to their favorite variations of songs they want to play, they should bring that information along to help things run more smoothly. 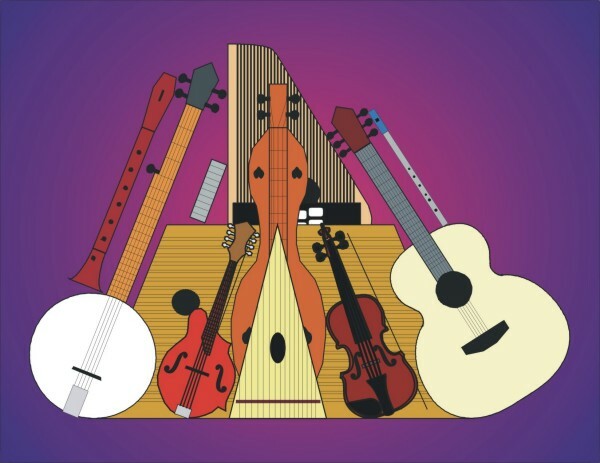 There will generally be some soprano, concert, tenor, and baritone ukes as well as some variations like banjo ukes or banjoleles at the meetings. Information about similarities and differences will be shared as appropriate to help people decide what might be appropriate for those who might want to purchase their own instruments. For more information about DUH!, Dulci-More, annual Dulci-More Festivals, or the Dulci-More Concert Series, check the website at www.dulcimore.org or contact Bill Schilling at bill@dulcimore.org or 234-564-3852. Contact Bill Schilling by e-mail. Return to Bill Schilling's Home Page.